Ewa Beach’s development did not begin with the plantations. Decades before the sugarcane was planted there was a community clustered around the coastline, its original, ancient growth springing from the fishing that provided food so amply for the Native Hawaiians. That small town was then joined by waves of immigrants who labored, and lived, on the vast plantation lands that were first farmed in 1890. For years, the vast majority of Ewa Beach homes were built by the owners of the plantation, leased to the workers who resided in them. In a sense, that was the first development on the Ewa Plain. It would not be the last. It did take, however, until the closing of the sugarcane farms in the late 1980’s for the real estate surge to begin. The sudden availability of wide open lands plus an escalating demand for new homes combined to create new neighborhoods where none existed before. Interestingly, the earliest Ewa Beach project was a government planned development, put together by something called the short-lived City & County of Honolulu Department of Housing and Community Development. Starting in 1987, this entity planned and created the West Loch Fairways & West Loch Estates neighborhoods. The Estates were completed first, with a 2nd phase of construction putting the Fairways homes in place. The dual neighborhoods, which sandwiched the West Loch Golf Course between them were the beginning of modern Ewa. Ewa Gentry Homes led much of the next stage, building now long established residential areas in Ewa Beach, in the suitably named Ewa Gentry. That included such creations as Ewa Gentry Sun Terra and Ewa Gentry Soda Creek. They followed the enduring template of houses and townhomes, rather than the high-rise condos that covered urban Honolulu. The condo communities that Gentry did build, such as Palm Villas & Palm Villas II in Ewa Gentry Soda Creek, consist of only 2 floors for the most part. Again, the open horizons and uncrowded feel was, and is today, the prime blueprint for residences across the Ewa Plain. Their work has extended to luxury levels as well, especially in recent years. Ewa Gentry Cypress Point has large homes of as much as 3,300 sq ft on very nice lots of 7,700 sq ft that lie along the manicured fairways of Hawaii Prince Golf Course. Ewa Villages has been an active area recently as well, with the presence of not one, but two well known companies changing the landscape further as of this writing. One, Castle & Cooke, is hard at work on their latest addition, the Ho’onani neighborhood, filled with single level homes of 3 to 5 bedrooms. 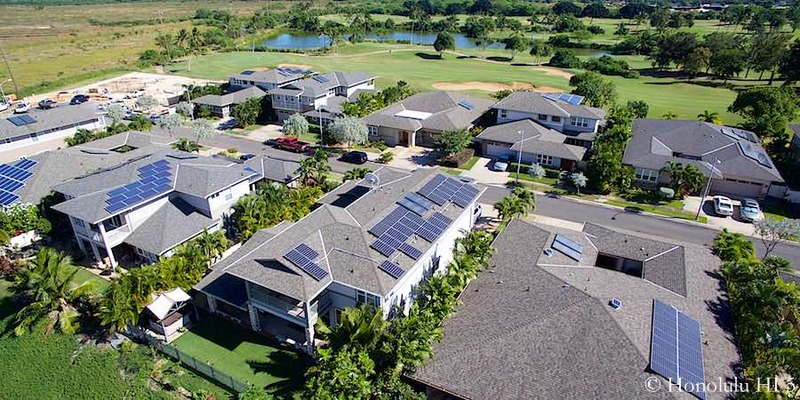 These houses in Ewa Villages lie along its namesake links, the Ewa Villages Golf Course. 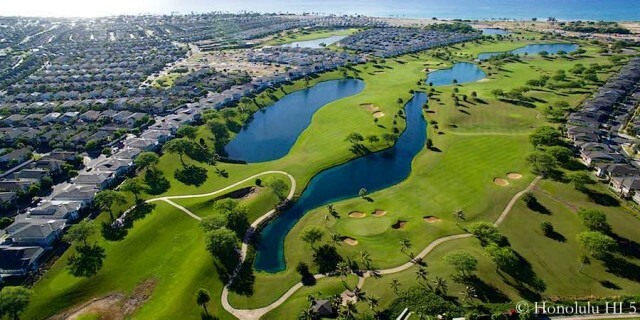 Also lying on the edges of that course are the newly built creations of DR Horton, a name well known in Oahu development. Their Golf Villas at Lokahi Greens will add 54 more homes to the area with 1,573 to 1,886 sq ft of space over 4 to 5 bedrooms. Haseko has been another major player in this region. They bought huge tracts of land in the late 80’s sell off by the plantations. Much of that now holds the Ocean Pointe neighborhood, its first houses sold in 1998. They ended up with 2,500 homes total in its boundaries, but didn’t stop there. Today, they’ve completed much of the Hoakalei development, which is aimed at home buyers interested in a ‘resort lifestyle’, revolving around the Ernie Els golf course, a soon-to-be completed lagoon playground and an actual resort property currently in-progress. 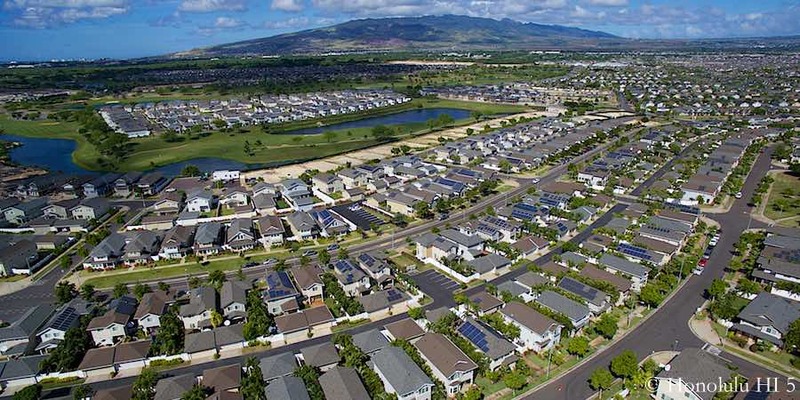 Ewa Beach is a still evolving city, built on its plantation roots, yet an important part of Oahu’s real estate future. Its mix of affordable properties with a growing volume of luxury areas point toward a city that will truly embody the full range of Hawaii’s life in the coming decades.